Digging into Sherri Lynn Wood’s new Book + A Giveaway! Sherri Lynn Wood has been a long time favorite among the Spoonflower crew. Her technique is inspiring and her quilts are breathtaking. 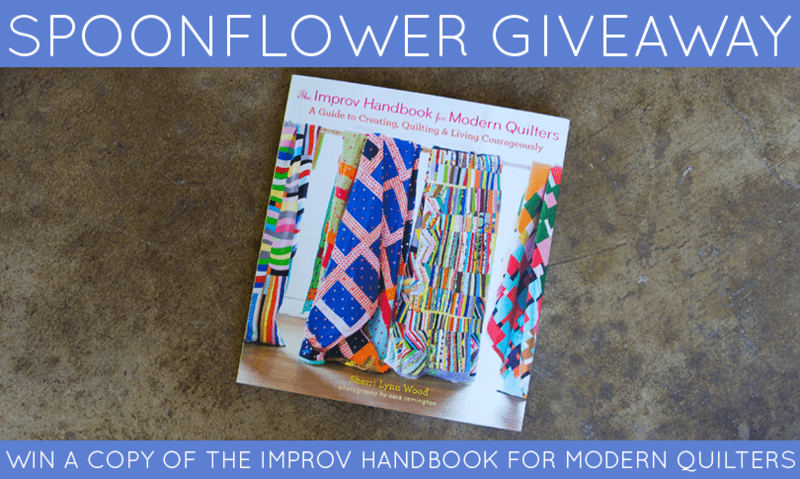 We were thrilled when we were asked to take a look at her newest book–The Improv Handbook for Modern Quilters, along with with gallery of test quilts. Read on for our thoughts on this inspiring quilting handbook and for a look at seven beautiful quilts stitched up using Sherri's improvisational technique. Plus–enter our giveaway for a chance to take home your very own copy of her wonderful new book! Wood’s Improv Handbook for Modern Quilters illuminates different aspects of the creative process of quilting that can be improvised upon to make a fluid and free-flowing creative journey from the fabric selection to the final stitch. 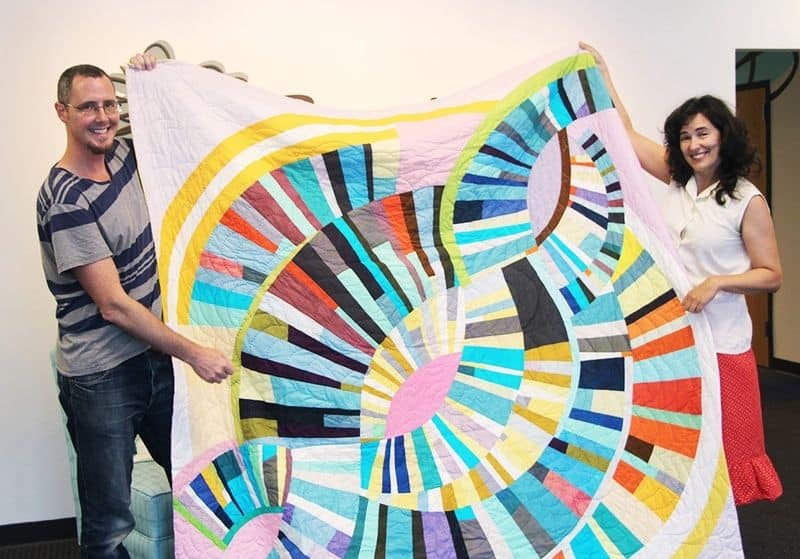 Drawing on social theories, oral histories, and even improv theatre techniques, Wood offers a holistic view of a quilting process as an opportunity to learn about yourself as a quilter and creator. The techniques illustrated in this work are unconventional–rather than offering patterns and recipes to reproduce some of her signature works, Wood instead provides a score, or a set of loose guidelines, that encourage you to find freedom in limitations. With Wood’s techniques, starting a quilt with a set of rules that are made to be broken is the first step in a creative journey with curves, darts, and dashed-lines leading you to a one-of-a-kind expression of a moment, a finished quilt with a personality and story all its own. Wood provides "Mind Tools" in the sidebar of her chapters, encouraging readers to find themselves in order to more intuitively and efficiently make creative decisions. These improv techniques encourage quilters to remain open to the possibilities that are presented at each stage of creating the quilt. She tackles the emotional blocks that can stymie creativity (“What if I cut into my precious fabric and end up hating this quilt? !” “I don’t know what fabrics to choose!” And on and on…) by reframing the creative conversation as an opportunity to learn about yourself, your preferences, your materials, and your environment. What happens, for instance, when you allow your seams to lean in the direction they seem to want to go? This collection of exercises and "scores" is a way of quilting to find yourself–even if you find that you are more of a stick-to-a-pattern type of quilter, well, knowing that certainly is worth the read. We are delighted to share this exclusive gallery of test quilts created from the Score for Showing Up. This score encourages us to boldly mashup a multitude of patterns and techniques to create unfamiliar and unexpected relationships. Ready to try your hand at improv quilting? We're offering one lucky winner the opportunity to take home a copy of Sherri's wonderful new book! Enter by Friday, June 5th, 2015 for a chance to win. We will contact the winner via email on Monday, June 8th. Good luck! If you're interested in learning these techniques with Sherri Lynn Wood, check out the dates for her current book tour! There are still spots available at her Quilting by the Lake 5-day retreat in Syracuse, NY July 27-31.